“When I am deeply engaged in making a work of art, I fall in love. I yearn for the beloved vision to emerge. 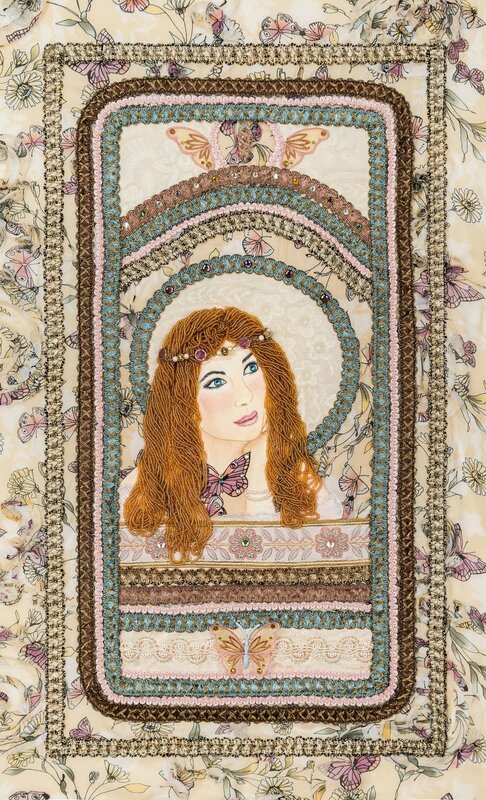 The work that I do creating Enchanted Heart Custom Portraits for clients, requires great patience and attention to detail and I have cultivated a profound sense of connection to my muse over a lifetime. This gives me the confidence to add the next layer and then the next, to a work that can take close to 200 hours to create. My favorite subjects are the feminine form & symbols in nature. I love the sparkle of jewels, the curl of the beads, the sheen of the fabric as it catches the light. For many years I designed and made wearable art. Outrageous denim jackets and the most gorgeous hand painted shirts. I sold them in resort boutiques from Santa fe to Ashland Oregon, at the LA clothing mart, and at festivals. I began making needle woven jewelry also, and as my career and spiritual path in the Women’s Wisdom and Goddess movements grew to be my primary focus, I developed ceremonial adornments and Alter pieces. 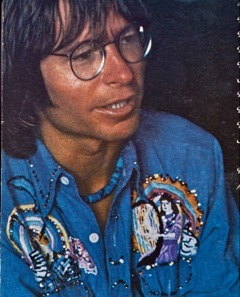 “ One of the greatest thrills of my life was when, at age 21, a shirt I designed, hand embroidered and rhinestoned was purchased as a gift for John Denver, and worn on the cover of his album, I want to Live.” I also saw him wear this shirt on some tv specials and at concerts. The design depicts rock & roll heaven over one pocket, including pearly gates, and King David with his harp playing for the sheep. Both designs are framed by rainbows. She travels from place to place, in her intricately carved wagon, filled with magical treasures, herbs and talismans. She offers her insights, her compassion, her dance and her free spirit to those seeking direction, inspiration & transformation. In this portrait, she gazes from a window of her wagon, her eyes filled with love and compassion, with joy and awe form the richness and beauty of life. She radiates an aura of color and vibrance! Her Holo is filled with pink roses, sign of the Divine Feminine. She teaches us to BE FREE. This is a great time on the planet Earth for the harvesting of the "Pearls of Wisdom" we each have within us. It is time for the flowering of humanity, each of us coming into full bloom. The many symbols, colors gems, and designs in my pieces all have significance. Here, the Crown signifies the opening of higher consciousness, the Butterfly, transformation, the hummingbird, Joy, the flowers, beauty, the pearls and diamonds, wisdom and refinement. our Goddess envisions dreams of wonder and wellness for all the world, and envisions millions of beautiful Butterflies taking her message near and far. She is of course, also a Goddess of the flowers, where the Butterfly receives it’s nourishment from pure nectar. May you be blessed with the qualities of the Butterfly, as you grow more radiant in your pure essential self every moment.